Not many spinners know this, but there is one UK battlefield memorial stone that commemorates not just the men, but also the women, affected by the conflict. And it depicts a hand-spinner. Saxton is where I used to go horse-riding with a friend, when we were teenagers (and I could borrow a horse) and Saxton church happens to be the burial place of Lord Dacre who died during the battle and was, according to local myth, buried sitting on his horse. (Not likely, I’m guessing. But captured our imaginations as kids). 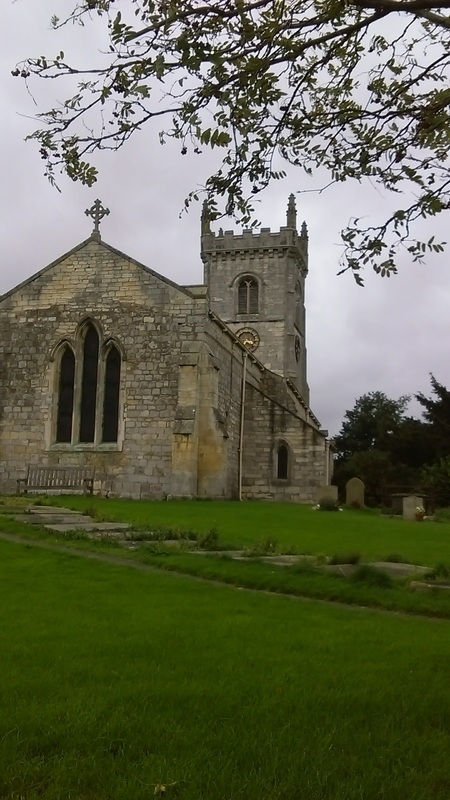 At nearby Saxton church, is the memorial to the Battle of Towton, fought on a snowy day in April, 1461 – allegedly the bloodiest battle ever fought on English soil. As kids, we were told the nearby beck ran red with blood. As Brown Owl and Guide Leader in our village, in the 1960s, my mum used to be part of a memorial ceremony there every year so it was a place of some significance to me, growing up. If you are one of the Sherburn 1940s-60s Guides or Brownies, and remember this – do get in touch. 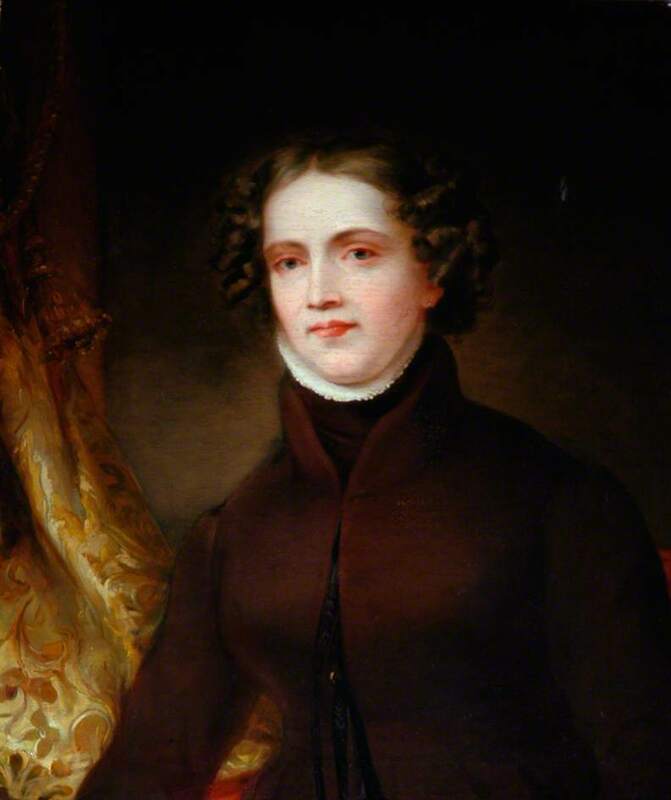 Mary’s daughter, here. Many years later, as a founder member of a re-enactment society, my husband had the honour of laying the wreath during the memorial ceremony, for a couple of years. No-one there but me knew it, but he was linking those ceremonies of the 1950s and ’60s, with the twenty first century. I vaguely remember something about the laying of flowers with my mother, and as a keen rose grower/collector with maybe 100 roses, as well as a local, it’s entirely likely she may have grown the elusive, now possibly lost, ‘Towton rose’ at some point (see below). Again, I have some really vague memory of it, I can’t quite get at. The Towton rose was strikingly pied – both red (Lancashire) and white (Yorkshire). Although there is a weatherworn (Victorian?) memorial stone up on the battlefield, a stone cross, where my mother and the churchgoers used to lay flowers annually if I remember rightly, there was never a monument to the battle, per se, until the early 2000s, when one was commissioned from artist Stephen Hines – after the mass burials on the battlefield were uncovered, up there. The memorial was carved on local stone from Morley. My husband and a re-enactment group he formed, were instrumental in efforts to get a memorial placed at nearby Saxton churchyard. Around that time, I did a talk for the Towton Battlefield Society about medieval women and spinning, and unknown to me, in the audience was the then-putative memorial’s sculptor, Stephen Hines. Lead whorls in my collection – fieldwalking finds of indeterminate date. Could be Anglo Saxon, could be late medieval or anything inbetween or beyond. Close of up woman with spindle and niddy noddy. CREDIT: David Hunt on bad android. Imagine my surprise when we went to the grand unveiling, somewhere round about 2004, only to find the memorial depicted not only the soldiers who fought that day; but a lone, anonymous woman – with a hand spindle, to honour the women who lived and died, in this area and their contribution – whilst men were fighting battles; women were getting on with the real business of life. 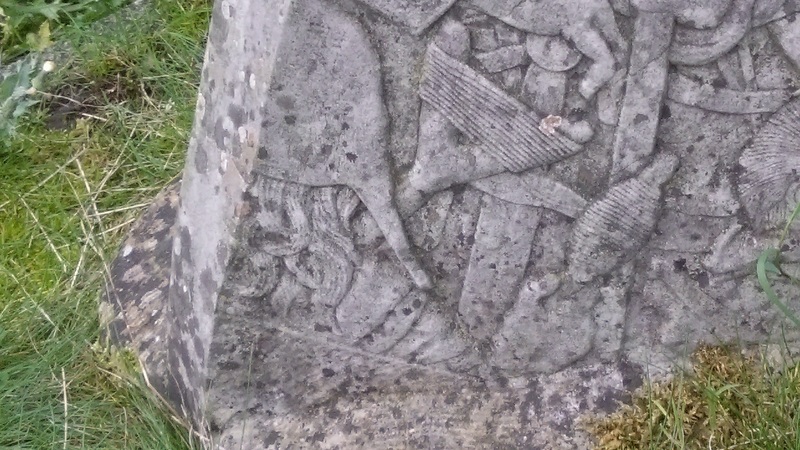 Husband says one of the men on the memorial, is wearing ‘his’ repro 15thC helmet, which he lent to the artist, and apparently the faces of the soldiers are of local people, but I rather like it that the spinner remains anonymous, with her back to us. We went up to look at the memorial again last Saturday, on impulse, as we were dropping one of our sons off nearby and had an afternoon to kill, before we picked him up again. 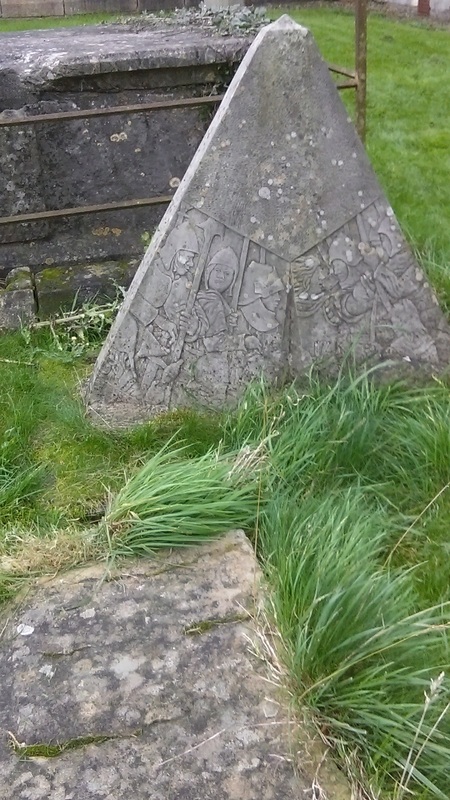 There is a slight family history connection, in that the Warringtons, a farming family mine married into in the nineteenth century, farmed for some time at Lead Church; a tiny, medieval chapel in the middle of a field, not far from the battlefield. We didn’t attempt Lead Church on Saturday as we had the dog with us, and she is scared of sheep! As we stood taking photos of the memorial, a dog-walker came up to us and said he was there the day it was unveiled, and his kids’ photos were in the local press. He looked surprised when we answered – so were we. 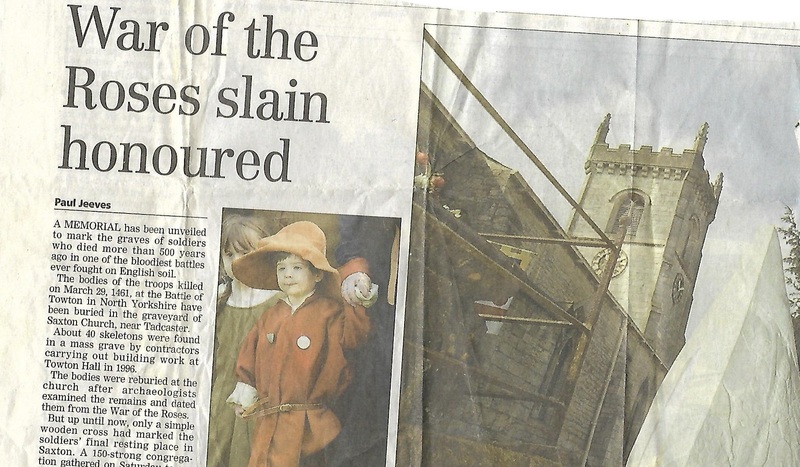 We were the re-enactors present, and my son was in the papers, as well. He was two, and wearing 15thC costume, so a shoo-in for the local press photographer. Nice to meet someone else who was there at the unveiling, as we stood in the churchyard. Lead spindle whorls and loom weights have been found on the battlefield (not much evidence of housing, or spoil heaps, if I recall correctly – so these finds are just random things dropped in the fields, at unknown dates). Lead whorls are, of curse, found all over the UK and usually out of context. Yesterday’s battlefield becomes tomorrow’s pasture, arable or back garden. Although not so much at the blasted, rugged corner of Yorkshire that is Towton, so the presence of spindles up there is intriguing. The local villages are badly gentrified now, but in my memory they are still like something from ‘The Famous Five’ – unspoilt, slightly tumbledown limestone houses with red and yellow pantile rooves, with pinnied elderly ladies in the front gardens, waving at us as we passed. As we drove there, I was recounting the names of the elderly ladies, I recalled from many years back. I saw every single name in the churchyard, later – one after the other. 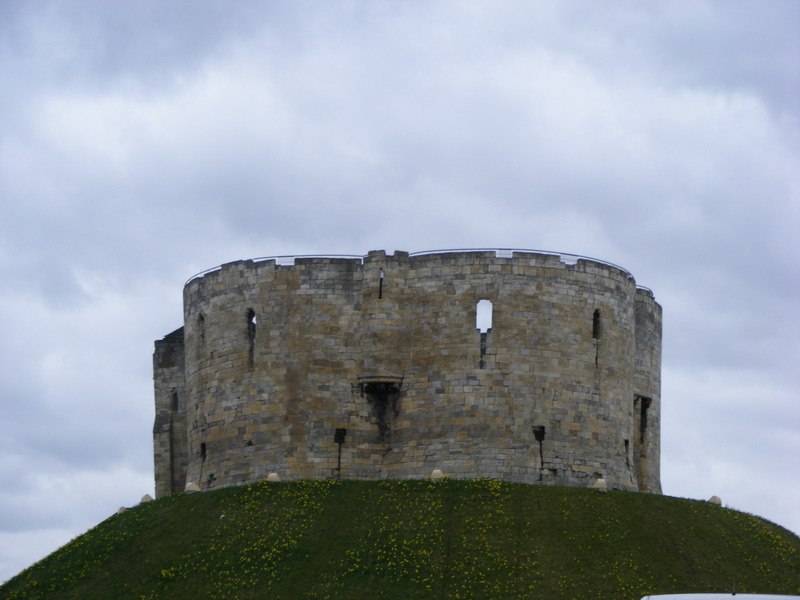 The local ‘big’ family during the War of the Roses, the Vavasours, were devoutly Roman Catholic and carefully kept out of the conflict that led to the bloodiest battle in English history, happening on their doorstep. Again, I may have a very faint link to the 18thC Vavasours, so in a tangential way, this is genealogy, as well! Parish records in the area tend to start around the 1480s, so just after this period. As kids, we’d often cycle up to the battlefield and hang around hoping to see ghosts. At my talk, was a gent who had not long since moved into a barn conversion at the other end of the battlefield, and he told me he had come along to the Towton Battlefield Society out of curiosity, because he kept being woken up in the middle of the night – by the sound of soldiers marching through the ground floor below! We were never ‘lucky’ enough to see anything up there, but it was bleak and very ‘Wuthering Heights’, so appealed to us as kids and later, as teenagers, we went up there often. One side of the memorial stone. Artist: Stephen Hines. There is a sense in which almost everything we do in life is, to borrow Keats’ phrase, “writ in water” – it’s all ephemeral. So I rather enjoy the fact that somewhere, set in stone, is an oblique record of a talk I gave, probably nearly 14 years ago. We sometimes forget what an heroic effort it was, when every single textile in the world was made on hand-spindles or great wheels. And so the thing I love about the Towton memorial, is that it honours women, and spinning. We still have gaps in our diary for talks for 2018, by the way. Current talks include: George Walker’s 1814 Tour of Yorkshire; History of Hand Spinning; Great Wheel Spinning; Land Girls; The Old Hand-Knitters of the Dales and Yorkshire Ganseys. But we are happy to tailor a talk to your specific requirements. So message me here if you’re a group secretary trying to set up your schedule and if we can fit you in, we will! If you come to one of our talks and want to memorialise it in stone – fill your boots!